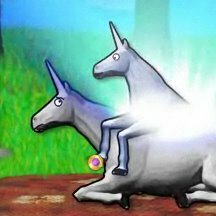 Here is the complete script to Charlie the Unicorn 2! Blue and Pink: Glub . . . glub glub . . . glub glub . . . glub glub . . . glub glub . . .
Blue: Look over there! It's a coral reef. Charlie: Oh look, it's you guys . . . and you're floating. Blue: Charlie, we're scuba diving, Charlie. Pink: We're exploring the depths of the ocean blue. Blue: Oh no! Here comes a school of poisonous foogle fish! Charlie: Ah, you gotta watch out for those. So, uh, go away. I'm watching TV. Blue: The vortex is open! Charlie: Oh god. Okay, what is this?! Pink: Charlie! We're being pulled into the vortex! Swim away, foogle fish, swim away! Charlie: Come on now. You guys are freaking me out! Turn this thing off! Blue: There's no stopping the vortex, Charlie! Charlie: Guys? Guys? Or girls . . . I'm not really not sure what you two are. . . .
Blue: Charlie! Charlie, I have the amulet! Charlie: What amulet?! What's going on?! Blue: The amulet, Charlie! The magical amulet! Sparkle sparkle! Charlie: I, I don't understand what you're talking about! Blue: The amulet . . . Nyeh! Nyeh! Pink: We got the amulet! Charlie: Great. Now go away! I'm tired of the horrible things that happen when you're around! Blue: We have to take the amulet to the Banana King. Charlie: Oh, yes, the Banana King, of course. Absolutely not! Pink: He, he's counting on us, Charlie! Ah . . .
Blue: If we don't give the amulet to the Banana King, the vortex will open and let out a thousand years of darkness. Charlie: Ah! All right, fine! I'll go! I'll go! Charlie: What are you two doing? Charlie: Oh, look at that. Pink and Blue: Ho ho ho ho ho! Charlie: Ahh! What did you two do?! Charlie: (mumbling) Just keeping walking, Charlie. Keep walking. . . .
Blue: Hop on board the train, Charlie. Pink: It's gonna take us to the Banana King. Charlie: I don't see any train. All I see is a giant sneaker. Blue: It's the Choo Choo Shoe, Charlie. Pink: The Choo Choo Shoe! Blue: Hurry, Charlie. It's about to leave. Pink and Blue: Chugga chugga chugga chugga chugga chugga chugga chugga shoe shoooooe! Chugga chugga chugga chugga chugga chugga chugga chugga shooe shoooooe! Charlie: Yeah, uh I forgot my boarding pass. I'll just walk. Blue: The Temple of the Banana King! Charlie: Great. Let's leave the amulet and go home. Charlie: No, no really. You guys see it, right? Charlie: I gotta be honest. I'm getting creeped out here. Somebody say something! Frogrus: Charlie, you look quite down with your big fat eyes and your big fat frown. The world doesn't have to be so gray! Charlie, when your life's a mess, when you're feeling blue, always in distress, I know what can wash that sad away. All you have to do is . . . put a banana in your ear! Charlie: A banana in my ear? Frogrus: Put a ripe banana right into your favorite ear! It's true. Frogrus: So true. Once it's in your gloom will disappear. The bad in the world is hard to hear, when in your ear a banana cheers, so go and put a banana in your ear! Frogrus and Bananas: Put a banana in your ear! Charlie: I'd rather keep my ear clear. Frogrus and Bananas: You'll never be happy if you live your life in fear. It's true. Charlie: Oh, of course, he burst into flames. Blue: Go fourth, magical amulet! Return to the Banana King! Blue: Charlie! YOU'RE the Banana King! Charlie: What? Hey, hey, hold on a minute! Banana: You're the Banana King, Charlie! Charlie: No! I'm not! That doesn't make sense! Blue: All hail the Banana King! Charlie: I'm not the Banana King! Blue: You ARE the Banana King! Charlie: No, NO! I . . . I . . .
Bananas: Banana! Banana! Banana! Banana! Banana! Charlie: I . . . I AM the Banana King! Banana: You ARE the Banana King! Charlie: I'm the Banana King! Yeah! Charlie: Hey, hey . . . where'd you go? Guys? Hello? Get me down from here! Charlie: Augh! Okay, that's a sprain. Charlie: Hello? Hello! Guys, where are you? Charlie: Argh! Ya gotta be . . . Great! They robbed me! Charlie: What do you want?! Yeah, I posted this before I figured out about articles, and now I'm too lazy to change it. So cool. I saw the Banana King on YouTube. i too was wondering what they said to Z.how did fimcow.com find that? Probably researched it, I also wondered what they were saying, pft, Tonight we dine on Turtles, lol. The fish are actually Fugu, a real poisonous pufferfish, not a foogle.